Looking for the best toy for your little digital baby? I’m’ sharing what our little guy is absolutely loving. Somehow our little Izaiah is already 14 weeks. He loves his Bumbo. He smiles and is just so stinking cute. I am back to work, and adjusting to life as a working mom to 3 kids. Thank God for my husband and thank God that Izaiah is learning to keep him self-occupied for short amounts of time. Izaiah’s newest thing is playing – which entails grabbing an object and shaking it like crazy, and then thinking about sticking it in his mouth. I found this and I had to share this with you. 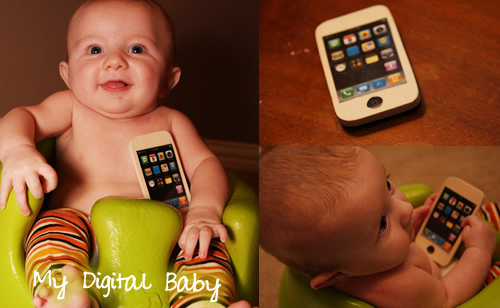 I definitely think it’s the best toy for your digital baby. My poor kid is bound to grow up digitized. I found this toy and my heart skipped a beat. This is a wooden toy iPhone with a laminate screen. The wood is very lightweight and smooth. This way the kid can chew all he wants on it and then throw it across the room without hurting someone (well I guess it would be slobbery!). I love that this is a digital product gone analog. How META! Like mommy, like son right? Of course, an iPhone obsessed mom would give her digital baby an iPhone, well wooden. We can talk about getting him a real iPhone in 12 or so years. Until then kid, enjoy this wooden iPhone. If you are looking for a cute baby gift for parents that are iPhone fanatics, or if you just want your baby to have all the toys the cool digital kids have – check out the wooden iPhone. This is the toy that I am loving right now! Do you have a toy that your baby absolutely loves? We would love to hear about it! Post it in the comments! What a pleasant surprise to find this post. I love your pictures. They are so cute. Is this phone completely NON-TOXIC if child puts it in his mouth?